For other uses, see Shake Hands with the Devil (disambiguation). 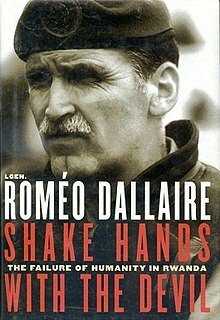 Shake Hands with the Devil: The Failure of Humanity in Rwanda is a book by Lieutenant-General Roméo Dallaire of the Canadian Forces, with help from Major Brent Beardsley. It was first published by Random House Canada in September 2003. The book chronicles Dallaire's tour as Force Commander of the United Nations Assistance Mission for Rwanda (UNAMIR) in 1993-1994, during which he witnessed the 1994 Rwandan Genocide. The book won the 2003 Shaughnessy Cohen Award for Political Writing, and 2004 Governor General's Award for nonfiction. The edition published in French is entitled J'ai serré la main du diable: La faillite de l'humanité au Rwanda. The documentary film Shake Hands with the Devil: The Journey of Roméo Dallaire (2004) and a 2007 dramatic feature film are inspired by and in part based on the book. Dallaire was consulted in the making of both films. In 1994, the Rwandan genocide killed more than 800,000 people in a hundred days. Lt. Gen. Roméo Dallaire witnessed these massacres. In Shaking Hands with the Devil, he paints a portrait of the difficulties and atrocities to which he was exposed. Arrived in Kigali on August 17,1993 Dallaire tries to warn the UN high authorities that he lacks equipment and men to carry out his mission. However, a lack of clarity in the UN's intervention procedures coupled with the lack of interest of the international community in Rwanda, an African country with a strategic position and limited natural resources, means that calls for Dallaire's help remains almost unanswered. From day to day, the situation is deteriorating. Eventually, the general's forces will be left on their own, without fuel, without money and under-equipped. Encouraged, among other things, by the propaganda of the Radio Télévision Libre des Mille Collines (RTLM), which calls for ethnic hatred, Hutu militiamen attack their Tutsi victims while an army of exiles begins a civil war, from the northern border of the country, to take power. In Kigali, corpses of civilians are piling up, several killed with machetes. The majority of the moderate politicians with whom Dallaire had the mandate to negotiate are assassinated. "About Shake Hands With the Devil: The Failure of Humanity in Rwanda."